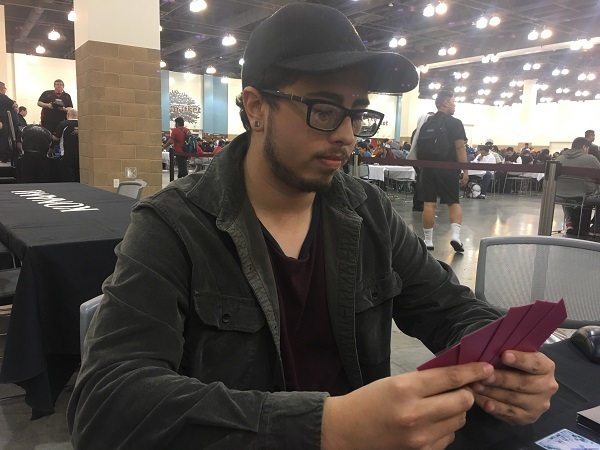 Brian Ramirez from Moreno Valley, California and Connor Farmer from San Diego, California are both currently 4-0 in the tournament, and both using Decks that have less representation in the tournament than lots of other Decks. Ramirez is using a Cyber Dragon, while Farmer is using Altergeists. Ramirez’s Deck specializes in taking down Decks reliant on Summoning from the Extra Deck thanks to its easy access to Chimeratech Megafleet Dragon, while Farmer’s Deck is less reliant than most of the tournament-popular Decks on Summoning monsters from the Extra Deck. That could make this a tough Match for Ramirez. 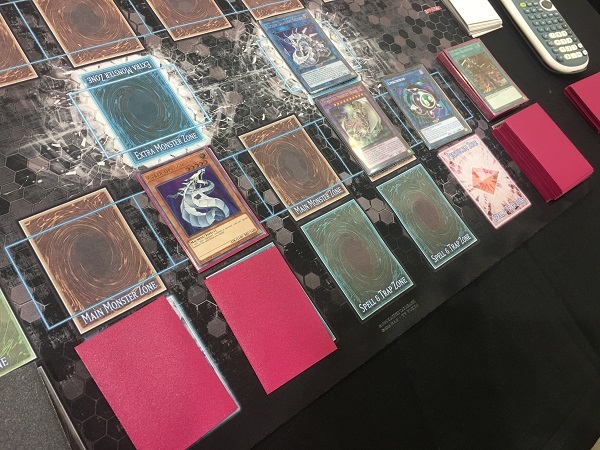 Nevertheless, a victory in this Swiss Round will make one of these Duelists 5-0 in the tournament, and both players will be Dueling their hardest to secure that record. It’s time to Duel! Ramirez won the roll but chose to go second. Farmer started off the Duel by Normal Summoning Altergeist Marionetter and used its effect to Set Altergeist Emulatelf to his back row. He Set 4 more cards to his back row next and then passed his turn. Ramirez opened up with Evenly Matched, Galaxy Soldier, Droll & Lock Bird, One for One, and Cyber Dragon Vier. He drew Ash Blossom & Joyous Spring for his turn, then entered his Battle Phase. When he did, Farmer flipped Personal Spoofing. He used its effect by sending his Marionetter to the Deck, and Ramirez discarded Ash Blossom & Joyous Spring to negate the effect. At the end of the Battle Phase, Ramirez activated Evenly Matched from his hand! Farmer banished 4 of his cards face-down, keeping only 1 of them! He had no cards left in his hand! Ramirez activated One for One by discarding his Droll & Lock Bird and Special Summon Cyber Dragon Herz from his Deck. He used its effect to change its Level to 5 and then discarded Vier to Special Summon Galaxy Soldier from his hand. He used his Soldier’s effect to add another Galaxy Soldier from his Deck to his hand, and then combined his 2 monsters to Xyz Summon Cyber Dragon Nova. He Xyz Summoned Cyber Dragon Infinity over it and then passed his turn. Farmer Summoned Marionetter and used its effect. Infinity tried to negate it, but Farmer flipped Altergeist Protocol to stop Infinity and destroy it by sending Marionetter to his Graveyard. He Set Altergeist Manifestation from his Deck with Marionetter’s effect and Ramirez added Cyber Dragon to his hand with the effect of his Herz. Ramirez drew Cybernetic Overflow and Set it. Farmer drew Pot of Duality and activated it to add Altergeist Multifaker from the top of his Deck to his hand before passing his turn. Ramirez activated Cybernetic Overflow in the End Phase and banished Cyber Dragon Herz and Cyber Dragon Vier from his Graveyard to destroy Farmer’s 2 face-down cards. Ramirez drew Machine Duplication and then passed his turn. Farmer drew another Pot of Duality and activated it to add Card of Demise from the top of his Deck to his hand. He Summoned Multifaker and then used Card of Demise to draw 3 cards. He Set all 3 of them and then ended his turn. Ramirez drew Cyber Emergency and activated it to add Cyber Dragon Core from his Deck to his hand. He Special Summoned Cyber Dragon and then Normal Summoned Cyber Dragon Core. He activated Core’s effect, and Farmer Chained Torrential Tribute to clear the field! After all monsters on the field were destroyed, Ramirez added Cyberload Fusion from his Deck to his hand. Farmer promptly conceded, predicting his own inevitable defeat. After a HUGE play with Evenly Matched on his first turn, Brian Ramirez wins the first Duel with his Cyber Dragon Deck! Farmer chose to go first in Duel 2 and started off the Match by activating Pot of Duality. He revealed Infinite Impermanence, Altergeist Manifestation, and Altergeist Marionetter from the top of his Deck and added the Impermanence to his hand before shuffling the other 2 revealed cards back into his Deck. He Normal Summoned Altergeist Meluseek next and Set 3 cards to his back row. He activated Card of Demise to draw 3 more cards, Set 1 of them, and then discarded Altergeist Multifaker and Altergeist Marionetter from his hand in the End Phase due to the effect of Card of Demise. Ramirez opened up with Gozen Match, Twin Twisters, Evenly Matched, Cyber Dragon, and One for One. He drew Cyber Dragon for his turn and once again entered his Battle Phase! At the end of his Battle Phase, he activated Evenly Matched from his hand! Farmer Chained Personal Spoofing and used its effect by shuffling his Meluseek into his Deck, and Ramirez Chained Twin Twisters. He discarded Cyber Dragon to destroy Personal Spoofing and a face-down Impermanence, and Farmer was then able to keep both of his face-down cards, since Ramirez had Evenly Matched and Twin Twisters face-up on his field. Ramirez activated One for One by discarding Cyber Dragon next and Special Summoned Herz. He used Herz to Link Summon Linkuriboh and then used Herz’s effect to add Cyber Dragon from his Deck to his hand. He Set Gozen Match to his back row and passed. Farmer drew a card and passed. Ramirez drew Foolish Burial and activated it to send Cyber Dragon Herz from his Deck to his Graveyard. He used Herz’s effect to add a different Cyber Dragon Herz from his Graveyard to his hand and then Tributed Linkuriboh to Summon Cyber Dragon from his hand. He attacked directly with Cyber Dragon, dropping Farmer down to 5900 Life Points. Farmer drew a card and Set it to his back row. Ramirez drew another copy of Herz and Set it. He attacked directly with Cyber Dragon and passed. Farmer Set a monster and passed his turn. Ramirez drew Cyber Emergency and activated it to add Cyber Dragon Core to his hand. Farmer immediately flipped Mind Crush, forcing him to discard the Core. Ramirez Flip Summoned Herz next, and then Special Summoned Linkuriboh from his Graveyard by Tributing Herz. He then used Herz’s effect to add Cyber Dragon Core from his Graveyard to his hand and Normal Summoned the Core. He used its effect to add Cybernetic Overflow from his Deck to his hand. He entered his Battle Phase and attacked Farmer’s face-down Altergeist Silquitous with Cyber Dragon to destroy it. Core and Linkuriboh attacked directly next. Ramirez Set his Cybernetic Overflow before passing. Ramirez drew Twin Twisters! He combined Cyber Dragon with Cyber Dragon Core to Link Summon Cyber Dragon Sieger and then activated Twin Twisters! He discarded Herz to destroy Farmer’s last 2 face-down cards: Solemn Strike and Waking the Dragon! He used Waking the Dragon to Special Summon Naturia Exterio from his Extra Deck to his Extra Monster Zone, and then Ramirez Normal Summoned Cyber Dragon Core and used its effect to add Cyber Revsystem from his Deck to his hand. He fused his Core with Naturia Exterio to Special Summon Chimeratech Megafleet Dragon Linked to Sieger, and then activated Cyber Revsystem to Special Summon Cyber Dragon from his Graveyard in Attack Position. Direct attacks from Cyber Dragon, Cyber Dragon Sieger, Linkuriboh, and Chimeratech Megafleet Dragon ended the Duel and the Match! 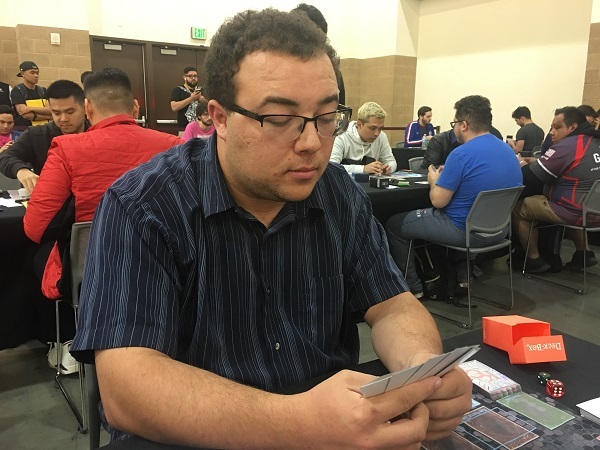 Brian Ramirez easily overcomes Naturia Exterio and advances with a 5-0 record using a Cyber Dragon Deck!